Classes | Pioneer Rescue & Outfitters LLC. Rescue personnel teams are in-demand now more than ever, and PRO is here to meet this fundamental need for up-to-date training through quality, hands-on classes. 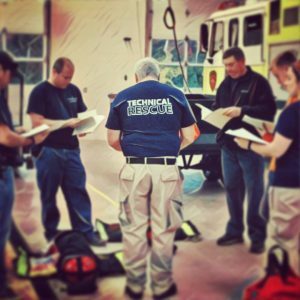 Our goal is to provide you with superior technical rescue training designed and customized to fit your needs. We bring the training to you; train with your team in your own jurisdiction. Don’t underestimate the hazards or you could pay with your life—when 60% of victims are would-be rescuers, it is crucial that those called out to the rescue (or just at the right place in the right time) are not only prepared, but confident in their ability to assist others even in the most dire of situations. We know that no two rescues are the same. Only quality training and thorough practice will give you the experience you need to be fully prepared. While technical rescue is dangerous, training and experience can help reduce the risk. What’s more, an experienced rescuer is better equipped for making judgment calls under pressure. PRO classes combine realistic training and hands-on experience with classroom work, visual aids, and real-life case studies for a comprehensive approach to training. And if you’re like us, you learn best by doing; our classes are practical and direct, with lesson plans that get you out of the classroom and onto the training ground.